If you have no time to hire a surveyor or getting a very attractive deal that you don’t want to turn down right away, it will help you if you know a bit about how to inspect a yacht. 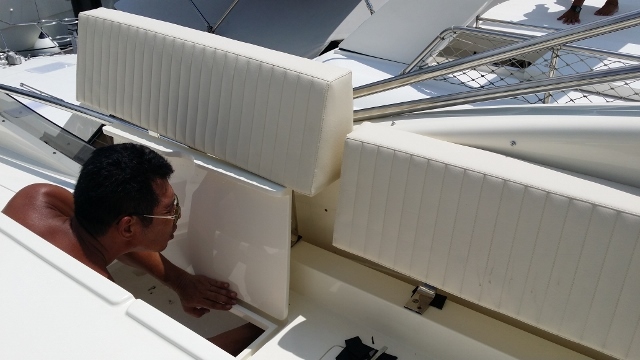 These few yacht inspection tips can tell you a lot about the motor yacht you are looking at. This article is not for total beginners and requires you to know some basic boating terms. First of all, you should always hire a professional surveyor to do the inspection and give you a full report, but sometimes if you are very interested and you meet a nice motivated owner, he will let you inspect before hiring a surveyor or sometimes when a new boat arrives you may also need to do some initial check ups by yourself. In some situations when you just have a great deal and no time to arrange a survey, knowing a little about inspecting a boat can help. But again, if you are in a situation that a vendor does not let you survey a boat professionally or rushes you unreasonably to complete, then there is likely something wrong and you should just walk away from the deal. 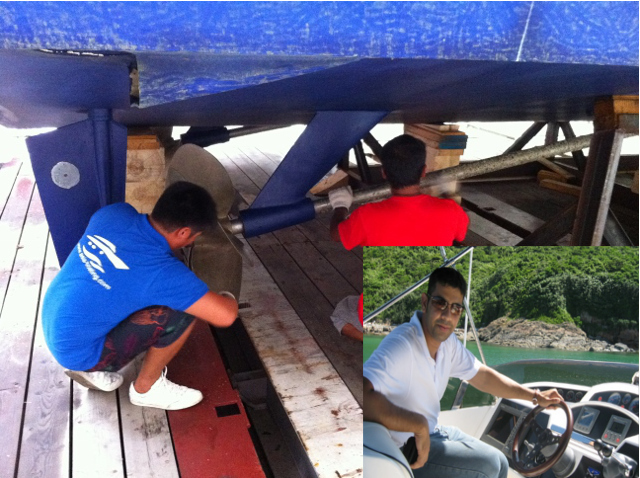 If for any reason you have to inspect a motor yacht by yourself, then here are few basic things that you should do. It of course does not guarantee that the yacht is in a good condition, but nevertheless it can tell you a lot about the yacht. At least it can tell you if you should proceed further to put a deposit and hire a professional for inspection. Important things to check are things like hull and structure, engines, machinery, alignment of shaft and propellers, interior wood, electrical system. It will always help to make a list of things on a piece of paper so you can tick it off when inspected. Sometimes you will find the yacht lifted up on a shipyard or in a shipping port and you can easily check the bottom of the boat and the whole hull. Use a simple torch light and look at the bottom of the boat carefully through out to check for any visible cracks, scratches or any small bubbles which could be hull osmosis. When you keep looking at the hull for a while, your eyes will adjust to the light and you maybe able to see if any part of the hull is deformed or has a different shade of color. So check if the color and shape appear to be uniform and smooth. If you spot something unusual, You can tap the hull with a small wooden block or an inspection hammer if you can find one and see if its making any abnormal sound, indicating that the hull was repaired due to any accident. 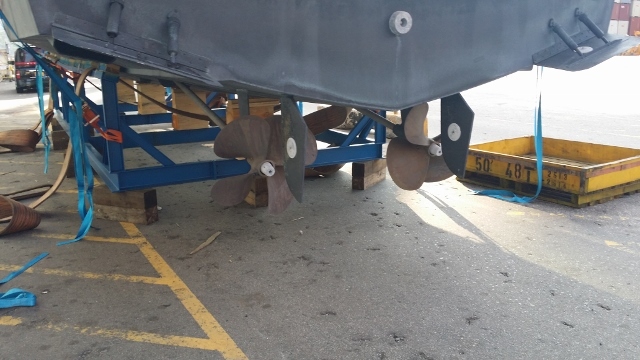 Turn the propeller firmly and they should turn fully, do the same to the forward bow thruster propellers, look for any visible cracks or chipped off parts on the propeller blades. You can even use the inspection hammer to lightly tap the main propeller, if it does not produce a smooth echo like a bell, then there could be cracks. Shake the shaft of the boat firmly and it should not be too shaky indicating that it is well installed. Check the trim tabs for any broken cylinders and touch it and move it up and down lightly just to see if the trim tabs are attached properly. 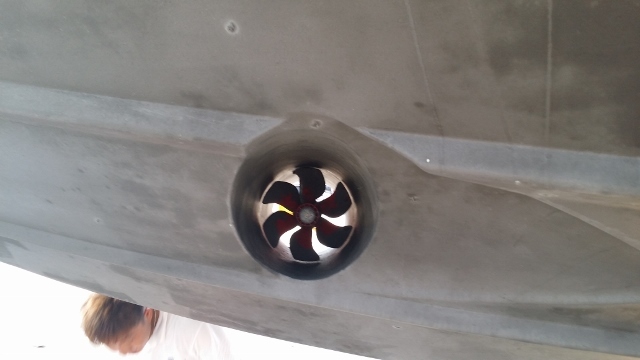 Don’t forget to check the zinc anodes, if they are too worn out and thin, it can indicate that the owner may not be maintaining the boat as regularly as he should. Many times the hull above is shiny white, and you will need to look at it for a while until your eyes settle down and then you start to see visible scratches, cracks or difference in the shades of the color.The difference in the color could indicate that the specific part of the hull was repaired, or you can guess if and extra structure was added at the back of the boat. Many boats have small patches of slight color differences indicating that scratches have been fixed with gelcoat. Walk around the hull to and pay attention to the window seals, they should not have cracks or be too dry which could cause water leakage during rain. Lot of times water gets in from screw holes from installed equipment such as navigation lights, radars, arcs, Antennas, seats etc. These things should be sealed properly with silicon or 3M marine sealant. Sometimes you can see broken seals if you try to look carefully. If you see any open or poorly sealed screw holes, there could be some water damage through out the structure of the boat, which will need to be checked more carefully later. Go to the flybridge and turn on electronic equipment, check all display screens, wash basin, icemakers or barbeques if the yacht has any. Check briefly things like flybridge and deck cushions, seats on flybridge, sunbeds on forward deck, see if things are sturdy and stable. Walk around the deck to check things like, Windscreen wipers, Anchor windlass, Anchor chains, Cranes or gangways at the aft. Nowadays many boats have swim platform that can go up and down, you can check that but also check that there should be a manual winch where a metal rod can be attached to move the swim platform up or down incase the electrical system fails. This system should be placed below at the aft somewhere inside a hatch very close to the swim platform. Check for safety equipment, like life jackets, fire extinguishers etc. Visually check the teak floor on the cockpit and deck for any damages, or rubber seal between coming off. The teak floor should not be too worn out, it does cost a bit to replace. After you have taken a look outside the motor yacht, then naturally the next thing you will do is step inside the yacht. A typical modern 50 foot motor yacht will have 3 cabins, a galley, 2 washrooms and a saloon with lower control station. The yacht should have typical entertainment system like DVD player, perhaps 4 speakers with a sound system and a pop up TV which many owners fancy. 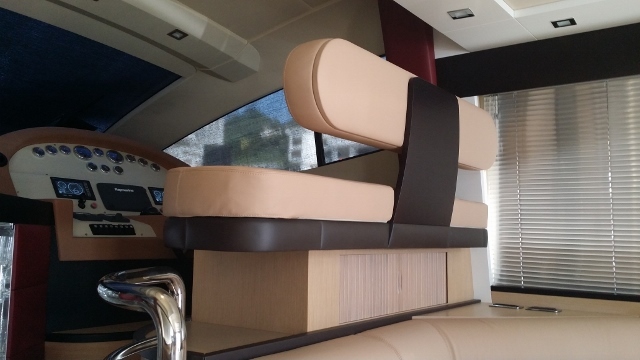 The boat interior is mainly made out of marine ply wood, which is basically few different types of wood layers that are glued together with special adhesives to make it water resistant and shock absorbent and lighter than solid wood. The top layer of the wood is normally Cherry wood, walnut, Oak wood or some other that the yacht designer may choose. There is also quite a bit of vynl also used in interior paneling in European boats, sometimes around the windows or passage ways or ceilings. Main thing you should check is the area around the windows from the inside, and check to see if there are any signs of water damage or water leaks. If there is any metal around the window frames, then look carefully for any corrosion or damage. You should be checking the area around all windows and port holes through out the interior. A basic check of interior furniture is necessary, Like carpets, sofas, curtains, blinds, Table tops, etc, Interior damages to furniture are easily replaceable. Sometimes the damages to vynl however, are not that easy, because it requires lot of material and skilled labor to change. Vynl panels that are installed in Europe normally come off in Asian countries after a year or more, because Asian countries are normally very hot and humid and the adhesive starts to come off. 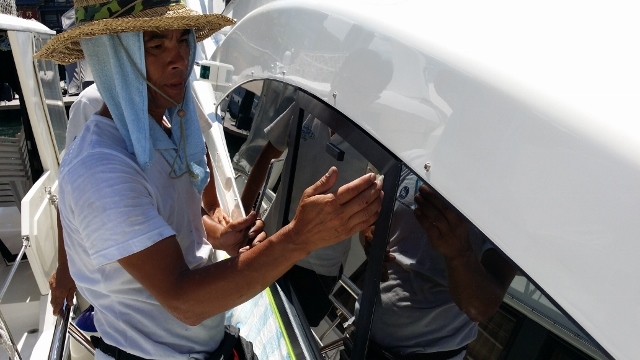 Also sometimes if the boat has rubbery plastic panels on the control helm, some of them become sticky and dirty during Asian summer. If you happen to have a water hose outside, then you can even spray some water from the hose on the boat for a few minutes especially around the windows and port holes and check if there is any water coming in. Then ensure that the shore power is connected and turn the switches on from the switch board which should be near the lower helm station. 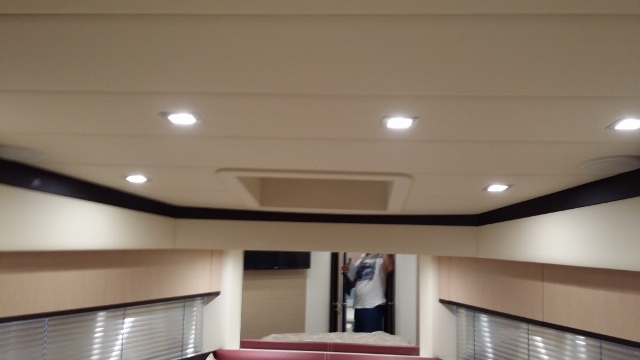 You should be able to operate lights, galley equipment, Air conditioning, water pumps should be turned on as well so you can flush the toilets and also the water taps start to work. Later disconnect the shore power and turn-on the generator, and try to turn on all electronics, switches, Galley equipment like electric cookers, Fridge, microwave. turn on the Air conditioning and check to see if all these can operate at the same time. This is to just ensure that the generator is strong enough to handle all the electrical equipment on the boat. Check all the electronics such as radar, VHF, Depth sounders, GPS systems, fish finders. Nowadays there are All in one systems, in which all the electronics are integrated in one screen, and it is also quite easy to operate. not much different than a personal computer. So play around with it. When you can see the radar moving, and GPS spotting your location and you can see the depth, temperature of water etc. Then the system should be working fine. Like I said, minor interior damages are not something to worry about too much, but if there are many small things that need to be fixed, you should consider the total costs. But there will also always be normal wear and tear. Which is also a good indicator that the boat has been used, and it is better to have a boat that has been used and maintained reasonably instead of buying a boat that has been sitting cold. For Bigger motor yachts usually above 40 feet or so. Engines are normally diesel inboard engines. Before starting the engines, make sure the battery switch is turned on in the engine room, ensure the batteries are not running out of power because most common reason for not being able to start the engines are dead batteries. Check the batteries, if the batteries are ok, and engine has a poor starting, there could be lots of reasons from empty fuel tanks or water in fuel to damaged injectors. In this case, your deal should be put on hold until you hire a engine service agent to do a inspection. 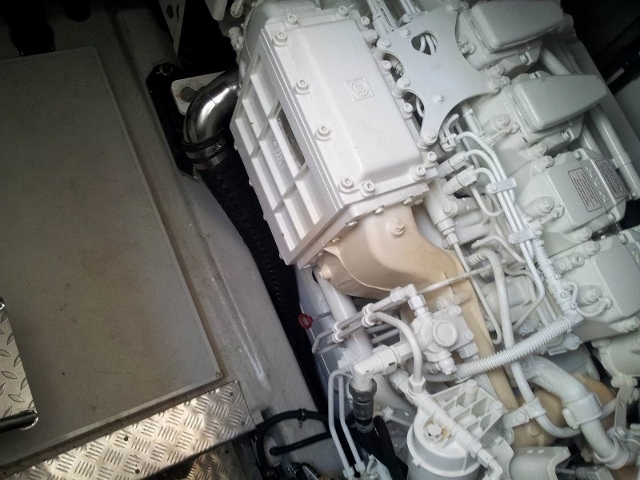 If engines are started easily, and there is not much smoke coming out of the engines, its good news. But if there is excessive smoke, then it will be of 3 types. White smoke, Black smoke, Blue Smoke. If there is white smoke, it could be because one of the following reasons, the fuel is dirty / engine oil needs to be changed / there is air in the fuel lines / water in the engine cylinders due to moisture in the tank / damaged gaskets. In this case, the engines will need to go through general maintenance and fuel tanks may need to be cleaned or flushed, you could also do simple things first and retry like changing fuel filters and air filters, check fuel lines. If there is black smoke : Most of the times this is due to clogged fuel filters, air filters or engine overload due to something stuck in the propeller like a rope, its recommended to check this and retry. If the black smoke still persists then it could be damaged injectors. In this case you should contact the engine service agent and get these things checked. 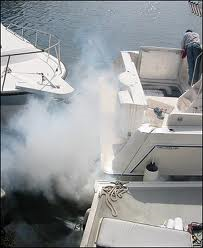 If there is blue smoke : this is not visibly very blue and it surely takes an experienced boater to see, but it usually means the oil is burning, so it could be due to leakages in pistons, oil leakages in the turbo charger or some worn out parts causing oil leakage inside the engine. If you see blueish smoke, it will be mostly black but a hint of blue then you should stop the trial, and get the engines checked by a professional if you are still interested. If the engine makes a knocking sound, called as engine knocking, it could again be dirty fuel, clogged fuel filters, damaged injectors or worn out internal parts. While the yacht is running, note any alarms that the engine display may show. Many times there is engine over heating alarm. This indicates that the engine could be over loaded, it normally happens when the engines are pushed a bit, during high RPM. Common reason for this is also that the cooling system of boat is blocked, could be due to marine growth blocking inlets, or the seacock is closed, or the cooling water pump is not working properly, there could also be just a plastic bag sucked into the cooling system, the oil level in the engine could also be low or the captain may have put a wrong type of oil in the engine. Check the oil level, inlet water filters to remove any trash which could be stuck, check the seacock and re-try. If the problem is still there it could also be due to damaged injectors, damaged gaskets or uneven load inside on the cylinders. In this case you will need to hire a professional to further check. When you are taking the boat for a sea-trail, it is always good to have a pen and a paper handy to note down few things, such as RPM of the boat, Engine temperatures, Oil Pressure, etc. If possible after 1000 RPM, try to increase RPM by 200 each time and stay on it for a couple of minutes to note down the details and speed of the boat too at that RPM. Eventually you will take the boat to a maximum RPM. Note the maximum RPM down. Note down the Engine details such as model numbers, so you can go back and download the engine spec sheet and compare if the engine has reached its full RPM as it is supposed to. For old motor yachts, there maybe some power loss. If the yacht cannot reach its full RPM, there could be a few reasons, the boat may have gotten heavier with added stuff in the yacht such as personal items, the water tanks and fuel tanks maybe full, the yacht may not have been trimmed properly, the water tide during the sea-trail could be rough or it could have been very windy and created more resistance, It could also be that the boat had a jet ski or other heavy items stored which increased weight, or simply the bimini cover of the flybridge was opened which could have added to resistance. If you have removed all these issues and created good condition and still the RPM did not reach its full state, It could be due to the propeller size being too large, in some cases people have said that the water density especially in Asia will create more resistance and could be a contributing factor. If the difference is around 100 RPM or less, then it normally is not considered as a problem even for a new boat, and the boat can be used normally. But many other factors of the engine should be checked by the professional before assuming its O.K. The service agent will normally come and check all aspects of the engines and see that the low RPM is not due to any internal damage of the engines. Basically for Engines, when you are testing them, it is always good to ensure that the Fuel filters are clean, there is no blockages in the water inlet or seacock, or the cooling system is clean and there is no debris stuck inside. It is good to have half a tank of fuel and almost empty water tank, put down the biminis, remove any jet skis or other heavy equipment before taking the boat out, ensure your batteries are charged, air filters are clean, impellers are not damaged and water pumps are working without any leakages. And then do a trial to avoid going back and forth and playing a guessing game during sea-trail. Lastly when you finish your engine trial, shut down the engine, let the engine room cool down a bit, and go inside the engine room to check for any type of leakages in the bilges. See if any oil has been leaked. Or any water leakage is there. Also check the engine room for any type of corrosions. Heavy rust is not a good sign. Also if the engines have been repainted recently for a used boat, it is not a good sign too. It could be an attempt to hide some major works done on the engine. If you find any leaks of oil and water, then you will need professional intervention. Also try to see if you can access things in engine room like water inlet filters, so you know what kind of tools you should carry for repairs. I know this is a rather long read, but who told you inspecting a yacht was an easy job! Again, I remind you to always use a qualified surveyor to do the test and if i have missed something or got something wrong here, please feel free to notify me. Thanks.